Talking to a designer about high frequency power electronics traditionally meant a discussion in the use of solid-state devices for power amplifiers in wireless network infrastructure. 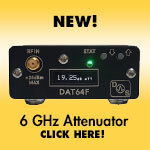 Solid-state high frequency components have primarily been used as means of transmitting information over the airwaves in both the defense and telecommunications markets. In this article, we will cover one key component, the high frequency PCB material and the unique challenges that this application poses to designers when handling very high power in small enclosures. 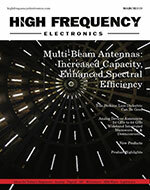 Historically, designers of high power electronics, like aeronautical radar systems and amplifiers for broadcast television, have turned to electrical parameters to manage the effects of high power caused by RF losses. By using materials with low dielectric constant and low loss tangent, insertion loss can be minimized and overall temperature rise can be limited. This methodology has given good results over the years, allowing many of us to watch broadcast TV or land at airports without much of a second thought. However, this approach does not take into account the benefits that substrate thermal conductivity has on keeping circuit temperature rise to a minimum. 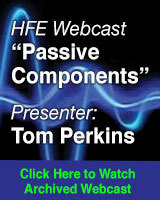 This method is what wireless communication infrastructure designers have taken advantage of with the adoption of materials with ceramic fillers. The next challenge, unique to RF cooking applications, is the need to develop systems operating at 250W to 300W single stage at 2.5GHz. This much power can generate a significant amount of heat. Finding the optimum, cost effective solution requires the benefits of increased thermal conductivity and possibly new material choices. Table 1 • Material properties, dielectric constant, dissipation factor and thermal conductivity. 1. RT/duroid® 5880 laminate (PTFE/random glass fibers): it has the best electrical properties, low dielectric constant (Dk) and very low loss tangent/dissipation factor (Df), mainly used in aerospace/defense market. 2. RO4350B™ laminate (thermoset resin/woven glass/ceramic filler): it is the most widely used material for power amplifiers used in wireless infrastructure. 3. RO3003™ laminate (PTFE/ceramic filler): best RF performance for commercial grade materials. 4. TC350™ laminate (PTFE/woven glass/ceramic filler): highest thermal conductivity material, commercial grade. 5. 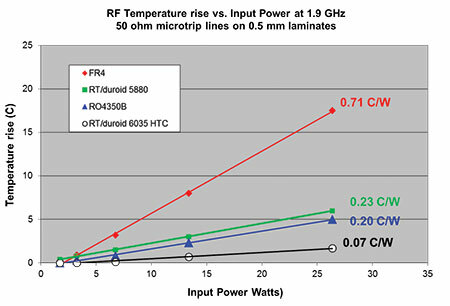 RT/duroid 6035HTC (PTFE/ceramic filler): highest thermal conductivity material in the market, aero/def grade. 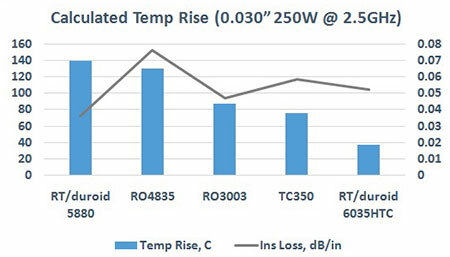 Calculated temperature rise and insertion loss are shown in Figure 1, for a 50Ω transmission line operating at 250W/2.5GHz on 0.030” dielectric with 1 oz. copper foil. What first stands out is that the material that has the best electrical performance in the group, has the worst thermal behavior and that is driven by the fact that it has the lowest thermal conductivity. Temperature rise of RO4350B material is in line with the best electrical performing, with a thermal conductivity 0f 0.62, this is enough to compensate for the significant increase in Dk and Df. At power levels of 100W or less, as is the case in most wireless infrastructure base stations, RO4350B provides an excellent balance of performance and cost, but going to 250W may require another solution to meet the recommendation of keeping overall temperature rise below 100C. Figure 1 • MWI software calculations for temperature rise and insertion loss. To get the best performance in high power would require a combination of both high thermal conductivity and low dissipation factor. RO3003 laminate and TC350 laminate offer unique approaches to this problem. With RO3003 material, we have a product with higher thermal conductivity but with very low loss while TC350 material has higher TC over RO3003 laminate but with increased Df. In the end, both commercial grade products are within 15% of each other. Functionally the best solution is the use of RT/duroid 6035HTC laminate, with its low Df and higher TC. Temperature rise for this configuration is less than 40°C, but this along with RT/duroid 5880 laminate have the highest cost, as they were designed primarily for aerospace/defense applications in mind where high product configuration mix and low volume are standard. Figure 2 • Measured temperature rise as a function of input power. To verify the validity of the modeled data, Rogers did testing using the power source of our PIM test equipment by Kaelus to generate a signal from a couple of watts to slightly higher than 25W @ 1.9GHz and measured the temperature rise as a function of input power for a 50Ω microstrip line on 0.020” material. In this evaluation, RT/duroid 5880, RO4350B, and RT/duroid 6035HTC materials were used and the results are shown in Figure 2. This data supports the modeled data given in figure 2, RT/duroid 5880 and RO4350B materials have similar response (within 10% to 15% of each other) while RT/duroid 6035HTC is one third in value as the previous materials, providing a technical solution to the problem of heat generation and with the support of the RFEA, the issue of economics can be addressed. Designing high power amplifiers with solid-state devices for use in microwave ovens requires selecting materials that have not only excellent RF performance, but also high thermal conductivity to address the overall problem of heat. Technical solutions for this technology are available today, but like in the case of solid-state drives, adoption will only increase as industry groups such as the RFEA set economic targets needed to facilitate mainstream market acceptance and reduce manufacturing costs. *Rogers Corporation is a founding member of the RF Energy Alliance.